H71PB is rated 4.8 out of 5 by 6. Rated 5 out of 5 by Spazm1702 from Traditional Faucet Handle I couldn't find a faucet handle for a Federal faucet, (which went out of business I was told). This faucet handle fit and worked like a charm. Was shipped fast and in new condition. Rated 5 out of 5 by k1n7 from One Traditional / Classic Clear Knob Handle Worked perfectly for my outdated application. I'm sue glad you stocked this item. Rated 5 out of 5 by CherylK from Looks terrific! I have been searching for a replacement knob and am so excited to have found exactly what I needed! It arrived quickly and was easy to install. Rated 5 out of 5 by wxcman from Just what we needed This handle replaced a 30 year old handle that had worn out. It went on easily and worked perfectly. Rated 4 out of 5 by Ryan from cap & screw included When reading information on this part (H71) and looking at the picture / description, it does not make mention of the additional parts (Cover & set screw) coming with it. From my shipment it looks like the cover & screw are part of the package, so there isn't a need to order the screw & cap (10 bucks of parts) as they are included. Does water need to be shut off to remove the old one and install a new one? Does removing the mounting screw loosen any other part of the faucet or only knob? I am ordering the H71 Single Clear Knob Handle Kit to replace my old handle, which goes off and falls in each and every use. Do I need to order any additional parts to install this new handle or does it come with all the necessary parts to hold the handle to the wall fixture? I want to update this handle H71 with a new chrome handle. Which one would fit? what makes the RP2389 different from the H71? I have a rather old bathroom tub fixture where I just tried to replace the old knob handle kit with the RP2389; however, the top of the valve stem kit is visible. Upon further review it appears as the hole in the knob that I have appears to be offset in comparison to the RP2389. Is the hole in the H71 offset to permit proper alignment with the valve cartridge stem? Will the H71 meet my needs? I have a clear knob style handle...H71. Can the newer handles that turn be substituted without changing out the stem? 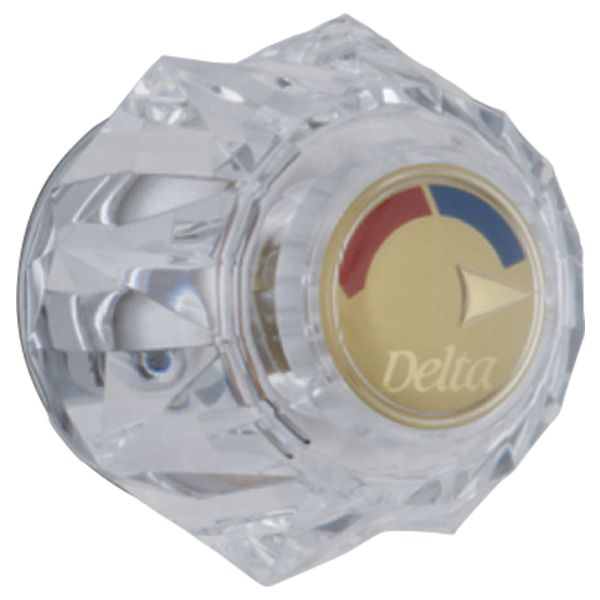 I have delta 1400 series Lockwood handle in the shower. Can I buy H71 as a replacemt handle? Thank you for your question. Delta Faucet model # H71 will fit the Lockwood shower series faucet. I have a H71 handle and need to change the cartridge. Would cartridge RP46074 fit?